I was sent an email today that claimed lessons about the Holocaust have been removed from the UK’s school history syllabus in case it offends Muslims who are in denial about its existence. First of all I find it incredible that an entire religious body could deny a plain historical fact. Can this really be so? And secondly, why on earth would the British Government endorse this sick and disgusting show of weakness to a minority pressure group. If that is what you’d call the entire Muslim community. It certainly resonates with the current trend to avoid confronting or challenging minority opinion in case it offends people. But to go this far, to run away from the truth, if indeed we are makes me very sad indeed. In fact, if it is true then I am appalled. Perhaps these photos were staged? The SQA is to be congratulated for mounting an exhibition, in the RSA no less, of A grade artworks by Scottish Schoolchildren sitting Standard, Int 2 and higher grade art. I saw it on wednesday and it is brilliant and must be seen. Here’s a taster by Steven Mcarthur of Williamwood High School. But it this piece of haunting animation by a young American?italian, Josef Feltus and his brother that stole the show for me. My Brother in law enjoyed the diatribe by McGlashen about the unfairness of world cup draws. but he has nominated this gem of Xenophobia as his favourite. Don’t blame me. I’m the medium. Not the message. Seen at Waverley Station this morning. 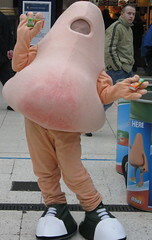 I dress up as a snotter-free nose. What my dad would have loved. This is what. Read all the comments here and follow the links. It’s basically the classic “Someone taking a photo of someone taking a photo routine” which my dad loved so much. Of course it’s a picnic. It’s Gleneagles.